The St. Lawrence River valley (SLRV) is an important orographic feature in eastern Canada that can affect surface wind patterns and contribute to locally higher amounts of precipitation. 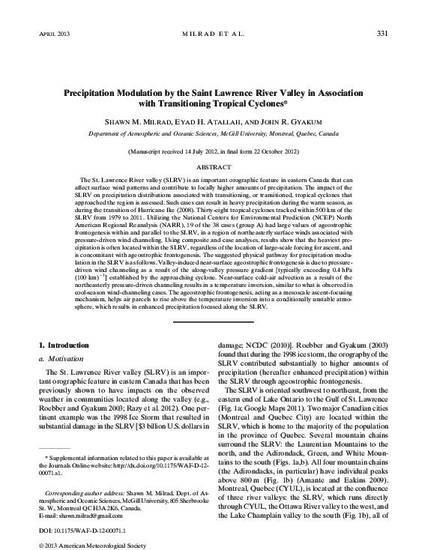 The impact of the SLRV on precipitation distributions associated with transitioning, or transitioned, tropical cyclones that approached the region is assessed. Such cases can result in heavy precipitation during the warm season, as during the transition of Hurricane Ike (2008). Thirty-eight tropical cyclones tracked within 500 km of the SLRV from 1979 to 2011. Utilizing the National Centers for Environmental Prediction (NCEP) North American Regional Reanalysis (NARR), 19 of the 38 cases (group A) had large values of ageostrophic frontogenesis within and parallel to the SLRV, in a region of northeasterly surface winds associated with pressure-driven wind channeling. Using composite and case analyses, results show that the heaviest precipitation is often located within the SLRV, regardless of the location of large-scale forcing for ascent, and is concomitant with ageostrophic frontogenesis. The suggested physical pathway for precipitation modulation in the SLRV is as follows. Valley-induced near-surface ageostrophic frontogenesis is due to pressure-driven wind channeling as a result of the along-valley pressure gradient [typically exceeding 0.4 hPa (100 km)−1] established by the approaching cyclone. Near-surface cold-air advection as a result of the northeasterly pressure-driven channeling results in a temperature inversion, similar to what is observed in cool-season wind-channeling cases. The ageostrophic frontogenesis, acting as a mesoscale ascent-focusing mechanism, helps air parcels to rise above the temperature inversion into a conditionally unstable atmosphere, which results in enhanced precipitation focused along the SLRV.